5 Big Fat Six-Pack Abs Lies & 15 Surefire Ways To Beat The Belly Fat! If you want to get a six pack, you need to do much more than just crunches and sit-ups. Here are 5 big fat lies about abs and fat loss that may be holding you back from getting the 6 pack abs you deserve and 15 ways to beat the belly bulge! Foods with high fructose corn syrup are typically very low in nutritional value. When doing cardio, stick to high-intensity, short-duration interval training. If you wish to remain healthy, you cannot understate the importance of dietary fiber. It doesn&apos;t matter if you do a million crunches a day, it is impossible to "spot-reduce" abdominal fat. Like the old saying goes "you cannot out-train a bad diet"; abs are made in the kitchen and not the gym. Diet is responsible for 90% of your results! In order to burn the fat that is covering up your abs you need a good diet and a solid strength training program backing it up. Abs are just like any other muscle. You wouldn&apos;t train legs every day so why would it make sense to train abs every day? Instead of overworking your abs on a daily basis, train them twice per week and throw in some unconventional ab exercises like Mountain Climbers and the Stability Ball Jackknife for an extra edge. Click Here For A Video Demonstration Of Jackknife Sit-Up. Crunches and sit-ups are two of the least effective exercises for developing eye popping six pack abs. Not only is doing an exercise where you can bang out hundreds of easy reps useless, but crunches and sit-ups can also cause lower back pain. Be sure to focus on quality reps and not the quantity of reps. Maintain strict form and stick to abdominal exercises where you can only perform sets in the 15-20 rep range. Be Sure To Focus On Quality Reps And Not The Quantity Of Reps. Your six-pack is not locked inside of a miracle potion or marketing pill. In fact, many of these "fat burner" pills can make your abs look worse because they eat up more muscle than fat! Stick to a fat-burning, muscle-building diet all year round and you will see better results than any fat burner pill will ever give you. You may hear people tell you that you will never lose your belly fat and get a six pack because you just don&apos;t have the "right genes." The sad part about this statement is that many trainers will even tell people this nonsense! If you have a trainer that ever tells you this crap make a run for it! The truth is that even if you have the "worst genes" ever, if you make better food choices and start working out smarter you can pretty much get any type of body you want. You Can Pretty Much Get Any Type Of Body You Want. Eating smaller meals more frequently is a surefire way to boost your metabolism and create a thermogenic effect inside the body. By combining lean protein with the correct types and amounts of green leafy vegetables, good carbs, and fats at the right times, you will super charge your metabolism and turn your body into a 24-7 fat burning machine. Of course the macronutrients will vary from person to person. Your 12-Week Daily Video Trainer - Tuesday, Week 4: Portion Sizes! This just re-emphasizes rule number 1. If you wait until you are absolutely starving to eat, you will most likely end up overeating, or hitting up a corner store or drive through joint and regretting it later. I also never, ever, ever buy foods that are tempting. If you keep foods like cookies, cakes, and chips out of the house and office you will be less likely to cheat and blow your diet. This is the most important meal of the day. This will give your metabolism a daily jump start and keep your fat loss efforts on track all day. Keep foods like cookies, cakes, frozen pizzas, and more out of the house. You will be less likely to cheat this way. Keep Foods Like Cookies, Cakes, Frozen Pizzas, And More Out Of The House. By planning your meals in advance, you will have prepared healthy food to eat throughout the day and be less likely to grab something unhealthy if you get a food craving. To make things easy, it is best to take one day of the week (typically on the weekend) and prepare all of your meals for the week. Your 12-Week Daily Video Trainer - Tuesday, Week 2: Preparing Your Food! Most of the fatty, processed, junk foods are kept in the middle isles. Since our bodies are over 70% water, drinking water is essential for optimal health. Water helps prime the body for fat loss, as well as flush out harmful toxins. Not drinking enough can lead to a water imbalance in the body, which can increase your risk of disease. As Well As Flush Out Harmful Toxins. Most carbohydrates cause the pancreas to produce insulin, which acts as a signal to the brain to stop you from feeling hungry. When you eat high fructose corn syrup however, the brain never gets this signal so you are more likely to overeat and gain weight. Also, foods with high fructose corn syrup are typically very low in nutritional value and VERY high in calories. Many of these foods have tons of calories and artificial ingredients. Use Stevia sweetener instead. Be extra careful to avoid white flour pasta, white bread, white sugar, and white rice. 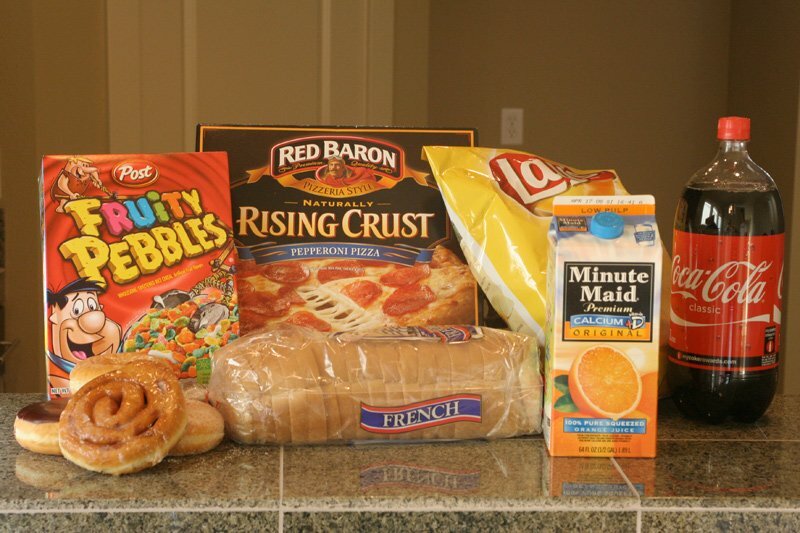 These types of foods have no nutritional value and do absolutely nothing good for your body. We usually don&apos;t get all of the vitamins and minerals we need from food so taking a multivitamin is a great way to ensure we get these essential nutrients. Daily consumption of a high-potency multivitamin/multimineral formula may help ensure the presence of essential cofactors necessary for thousands of metabolic reactions. In order to burn fat and develop six pack abs you must work out efficiently, so be sure to maintain maximum intensity and focus for the duration of the training session. Skip the long boring 60 minute cardio sessions on the treadmill and trim that down into 15-20 minutes of high intensity interval training. Stick To High Intensity, Short-Duration Interval Training. Top 5 Questions Women Need Answered To Start A Fat Loss Program Off Right! Will weight training make you bulky? Will carbs make you gain fat? What about 3 square meals a day? Discover the answers to the top 5 questions women need answered to start a fat loss program off right!